Hey, friends! Do you ever find yourself staring in the mirror, face red and irritated from where you've been popping your damn zits, and realise you really need to reevaluate your skincare choices? That was me about a month ago. My fickle skin was fed up with the Mario Badescu goodies that I lovingly supplied it with and decided to protest in the form of mountainous acne and uneven tone - my favourite. Thankfully, the stars aligned perfectly in my favour as some new skincare items showed up to my door to save the day, and now, like the beauty blogger I am, I feel I must share them with you! 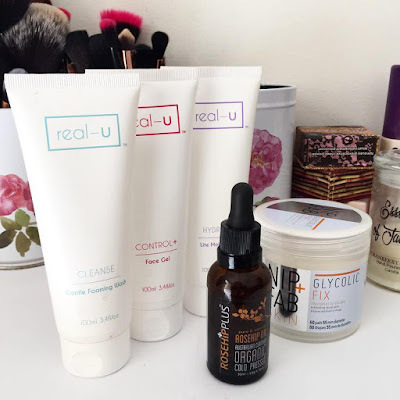 Real-U skincare is making the rounds on Instagram lately and it isn't hard to see why; not only are the products hypoallergenic and gentle, but the founder Ebony is one of the loveliest people I've ever consulted with. She gifted me the Cleanser, Control Gel and Moisturiser, and also included the most adorable notebook with a sweet personalised message. How nice is that? Call me easily impressed but this small touch made my day. Anyhow, I was wary of the cleanser. Since my skin has transitioned from my adolescent oil slick days to a much more controlled early 20's situation, foaming cleansers have become a little too harsh. However, this baby is now a staple in my every day routine! 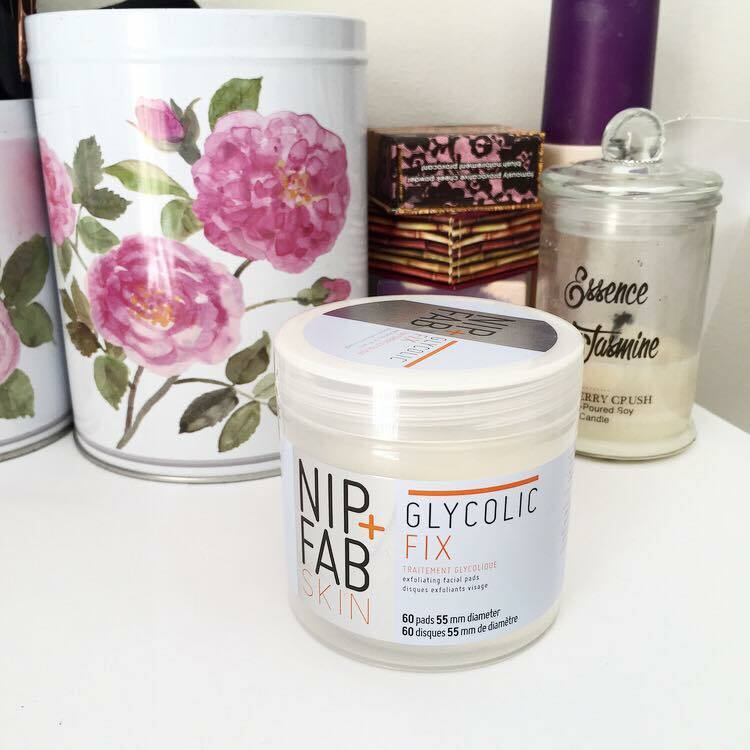 Perhaps it is the hypoallergenic ingredients, but this stuff is so light and leaves my skin feeling completely clean and gunk-free. No one likes a gunk face. Unfortunately, the moisturiser did not work with my skin type, however as I've mentioned in previous posts, my face is pickier than Peter with his pickled peppers when it comes to moisturiser. The control gel has made a wonderful addition to my spot prevention, however! I'd highly recommend this line, especially if you are interested in cutting out nasty ingredients. I'm new to the world of chemical exfoliants, but the Nip and Fab Glycolic Fix Exfoliating Pads are growing a little space in my heart - right next to the big space I have for videos of kittens falling over. The glycolic acid in these wonder wipes eats (less terrifying than it sounds) your dead skin, while the hyaluronic acid and blue daisy soothe and the surface left behind. There's no burning - or even a tingle, to be honest - and so I initially feared they weren't doing anything. My smooth, even skin a few days later kindly proved me wrong and thanked me for not scrubbing it to death with abrasive beads. If you live in Australia, this line is available from Target! 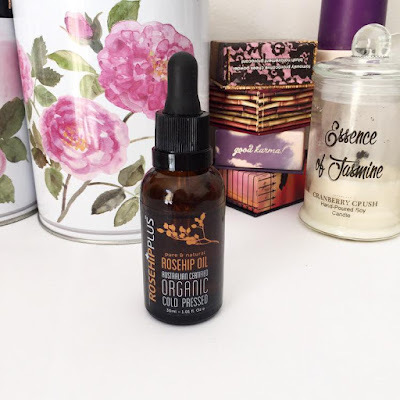 The final new addition to my routine is one that was incredibly surprising for me - Rosehip Oil. I solemnly swore I would never include oil in my skin care routine as I was sure that oil=bad in the way that I was sure garlic bread=yummy. However, using this as my night-time moisturiser has drastically lowered my oil levels, while raising my hydration levels to those never before seen in my face area. Applying oil onto your face actually minimises the activity of your oil glands, effectively giving them a well-earned holiday. I'm using the brand Rosehip Plus, which is super lovely albeit very organic smelling. I actually received this stuff in my Bloggers United goodie bag, and will definitely be repurchasing more! What are your holy grail skincare products? I'd love to know!